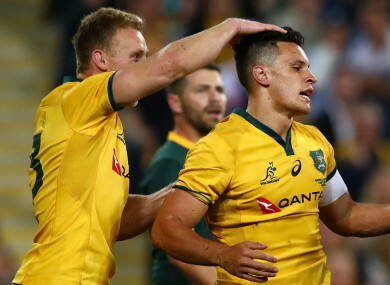 AN INJURY-HIT Australia side claimed their first win of the Rugby Championship, beating South Africa 23-18 to ease some of the pressure on coach Michael Cheika. The Wallabies made a dismal start to the tournament, with two heavy defeats to the All Blacks leading to questions surrounding the future of Cheika ahead of next year’s World Cup. Cheika shook things up for the visit of the Springboks to Suncorp Stadium, dropping fly-half Bernard Foley, but was also unable to call on Israel Folau and David Pocock, out with ankle and neck injuries respectively, while Adam Coleman withdrew from the squad for family reasons. It looked as if it would be another difficult day for Cheika when South Africa hit back following Michael Hooper’s early try to lead 15-7. However, a poor pass from Mbongeni Mbonami that presented Matt Toomua with a try breathed life into Cheika’s side, who dictated proceedings after the break and handed South Africa, beaten by Argentina last time out, a second successive defeat thanks to a pair of Toomua penalties. Hooper touched down from the back of the breakdown after two minutes but South Africa took control thereafter. Elton Jantjies slotted over a penalty before good lineout ball allowed Mbonami to crash over from a driving maul. Faf de Klerk then found Makazole Mapimpi with a cut-out pass to send the wing over in the right corner. However, Mbonami gifted Australia a try with a terrible long and loose pass that Toomua gleefully pounced on to slide under the posts before Jantjies and Reece Hodge traded penalties, the latter converting from inside his own half. The Wallabies’ momentum carried into the second half, which they spent the early stages of camped on the Springboks line. South Africa produced defensive heroics to keep Australia from crossing for a third time but the pressure eventually told when Toomua booted the hosts into the lead. The Springboks responded well but their execution with ball in hand was sloppy and the final points of a second half that was sorely lacking in quality came from Toomua as South Africa failed to capitalise on late territory, Cheika gaining some much-needed respite. Email “Injury-hit Australia break losing streak as Springboks stumble again”. Feedback on “Injury-hit Australia break losing streak as Springboks stumble again”.